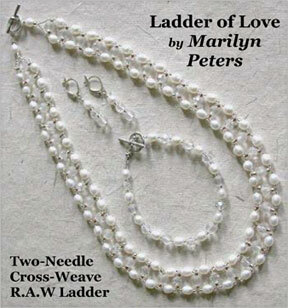 Two-Needle Cross-Weave R.A.W Ladder: Shown in creamy white pearls, clear & frosted crystal, this versatile set is perfect for the Bride on her special day. Picture it in fun, vibrant color dyed pearls and jewel-tone fire polished crystals to match the bridesmaids. Basic supplies are listed below (detailed list is included with the project).